At Moose Knuckles, we stand behind the quality of every garment we manufacture and hope you are happy with your Moose Knuckles product. All Moose Knuckles products are fully warranted to the original owner against defects in materials and workmanship. A proof of purchase is mandatory for any warranty issue. If your Moose Knuckles product fails due to a manufacturing defect, our first option will be to repair the item free of charge. If the product is not repairable, or if the cost of repairing the item exceeds the cost of a new one, we will replace it at our option. This warranty does not cover damage caused by accidents, improper care, negligence, normal wear and tear, or the natural breakdown of colors and materials over extended time and use. In such cases, we will offer you an option to repair the item for a reasonable charge, where we are able to effect such repair. As you know, every product will end up showing signs of age and wear over time. We always take this into consideration when assessing your warranty request. It may be that your product has simply reached its practical lifetime and needs to be replaced. This warranty is valid exclusively in the country of purchase and through the original retailer. This is the only official Moose Knuckles web store. 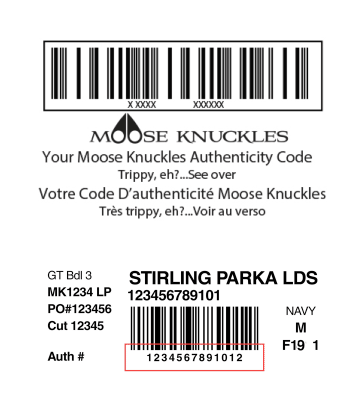 Inside each Moose Knuckles coat and jacket there is a hologram tag that acts as an authentic product identifier. To check your jacket''s authenticity, please enter the 13 digit (auth #) code printed under the bar code in the form below.